Items of interest to the 1940s enthusiast that don't seem to fit anywhere else. Worth a look, you never know what you might find! D-Day Cricket - The signalling device for members of the US 101st Airborne Division on D-Day. It was after the Airborne operation over Sicily in 1943 that Commander Taylor, the future general commanding the 101st Airborne Division (The Screaming Eagles), realized the importance of communication among the parachuted units in enemy territory. Scattered in various places, isolated paratroopers often had a hard time to find their comrades without risking exposure to enemy fire. The Americans reused the principle of a popular toy at the time, the Cricket consisted of a steel spring blade emitting a click-clack when pressed and released (similar in sound to the insect). British manufactures were given an order of several thousand of the devices to be used by the 101st Airborne Division on D-Day. To use the device, it was squeezed, flexing the steel spring and making a 'click-clack'- asking for the identification. The response should be a double squeeze making two 'click-clacks'. If the response was not two click-clacks the Para opened fire! This is a faithful reproduction of the original device. 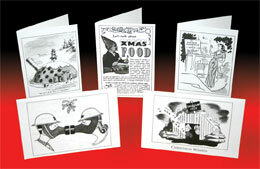 10 Christmas Cards featuring a lovely selection of cartoons, drawings and advertisements from World War Two. Each pack contains 2 of each design printed on a quality card with matching envelope. Great cards for those with a love of the 1940s. Careless Talk Costs Lives. . . .
. . . . But this need not prevent me sending you a greeting. 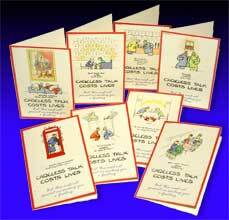 The complete set of 8 "Careless Talk Costs Lives" WW2 greeting cards are now available. 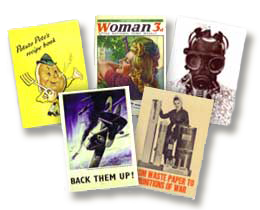 The cards, based on the wartime posters by Fougasse are beautifully reproduced and being blank inside are perfect for any occasion. Keep in touch with friends and colleagues or simply display on the mantlepiece!! 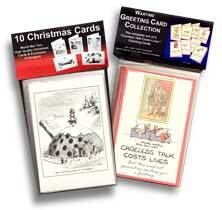 Buy both the Christmas Card pack and the Greeting Card pack for one special combined price. 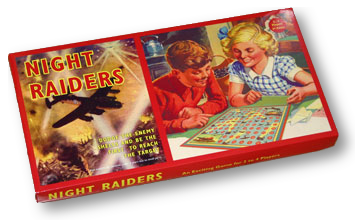 Be the first to reach your enemy target in this excellent reproduction of this wartime board game. (2 to 4 players). 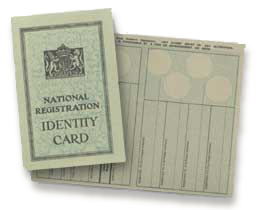 Ideal for re-enactors, this Identity Card would have been issued to adults AND CHILDREN in September 1939. It continued to be used by the CHILDREN it was issued to throughout the war although ADULTS had this card replaced in May 1943 with the redesigned (green) 1943 Identity Card (see next item). This excellent reproduction is completely blank, ready to be filled in with the holders details. The card is a good reproduction and a few days in the wallet or ID holder will give it that slightly used worn look. 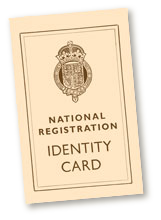 Ideal for re-enactors, this Identity Card would have been issued to adults in May 1943 as a replacement to the 1939 Identity Card. This excellent reproduction is completely blank, ready to be filled in with the holders details. A set of 5 high quality gloss postcards. Great for keeping in touch or brightening up the message board. This packet does NOT contain dried egg. It is a reproduction of a wartime packet for display purposes. 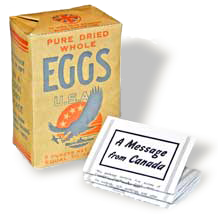 It comes with "A Message from Canada" a reproduction of a wartime double sided information sheet whch was shipped with dried egg. This sheet explains how dried egg was used together with a number of recipes. Great for decorating your party or event this plasic bunting is ideal for inside or out. Each pack is 10 metres long. A 5 feet by 3 feet Union Jack with eyelets. Great for display, decoration or flagpole (100% polyester). Great for decorating your party or event this plasic bunting is ideal for inside or out. Each pack is 10m long. Pack of 10 "hand held" Union Jack flags. Ideal for waving patriotically. Additional postage costs are occasionally required when items are sent by courier. Please select this item only after discussion with the 1940s Society.